Watch the next few hours in $PG trading. The Feb 18 62.50 PUTs sold at this morning for up to $0.40. If we see the day turning for the worst, I'd say this would be a nice trade if you are looking for some delta-positive exposure. 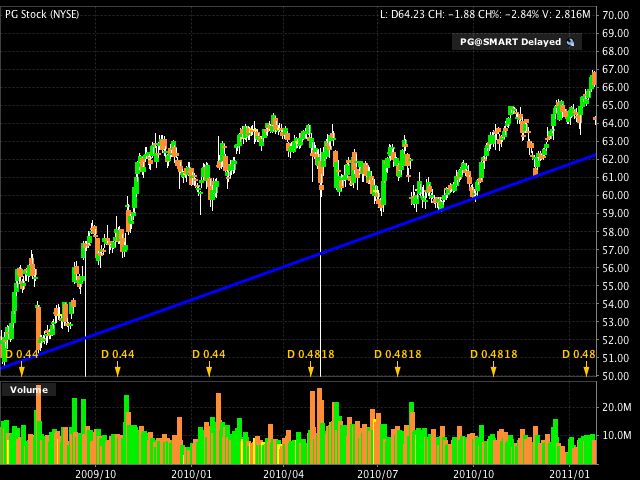 Will PG fall and hit it's trendline again? Maybe, but the general updraft is powerful and I wouldn't put my money on the short side. Plus, we have GDP numbers tomorrow and, uncharacteristically, I'll take the over on the 3.5 estimate. If you are expecting GDP numbers to disappoint, you might want to wait. Disclosure: No position yet, but if I can get a good price, I'm looking to sell those PUTs.